The candidates will get an environment which promotes trans-disciplinary research. The last date of AcSIR Summer Training Program 2017 application submission is January 13, 2017. → Total no of Fellowship is 20. → The total duration of the fellowship is two months between the month of may-august. 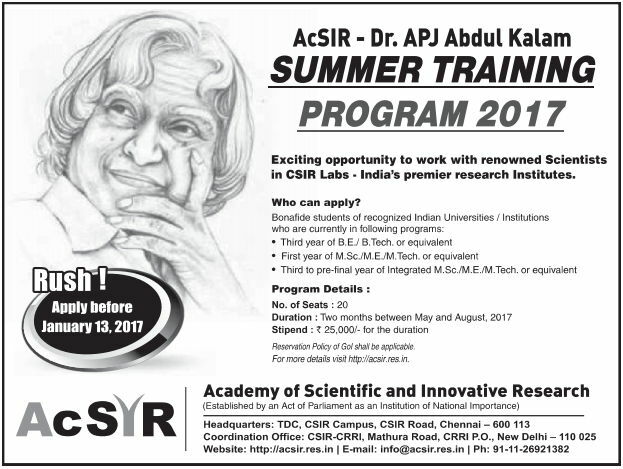 → Twenty-five CSIR laboratories are participating in AcSIR Summer Training Program. → Students who are pursuing M.Sc/ M.E/M.tech/ B.E/B.tech they can apply. Candidate can apply for this fellowship through online mode only. Few selected students will get a chance to stay on the campus of the respective CSIR Labs and work with some intellectual and leading scientists in India. The candidate who wants to apply for this fellowship must register first with the academy by providing his/her general detail such as Name, DOB, Address, Gender, Contact Number, etc. → Candidate has to fill his/her personal details such as Name, DOB, Address, Gender, Contact Number, etc. → Candidate has to fill his/her academic details of PG, UG, 12th, 10th level etc. Plagiarism Check Report (To certifying that the Research Proposal is original). It is to be noted that the candidates have to calculate CGPA in accordance with the Percentage to CGPA conversion formula of their respective Institute. → Applicants with the percentage - 95%, shall fill 10 CGPA. → If the CGPA of an applicant is on a scale other than 10, then the CGPA shall be required to be proportionately translated to 10.